The funeral of Madelaine Jay is at Nun’s Cross Church today at 12:30 and I think that her passing at 95 years old should be marked by the importance she has played to the River Vartry and for her contribution to Ashford. In reflection, I was struck but the fact that along the river were several important women who’s lives were wound around the river. Madelaine Jay and Maureen Gelletlie both spent their lives caring for and looking after our heritage along the river; Mount Usher Gardens and Hunter’s Hotel. Madeline Jay helped to preserve Mount Usher Gardens from 1980 when she took over from the Walpole family. In 2007 she decided to invite the Donald Pratt and his son to take over the café. Bringing the Avoca brand and the Pratt’s stewardship to the Gardens has re-energised them and helped with it’s long term preservation. Further down at Hunter’s Maureen’s sons, Richard and Tom, continue to care for and preserve Hunter’s. The Pratts, the Gelletlie, and the Jays are members of the River Vartry Protection Society and help to make sure the river remains a clean, vibrant part of our lives. We give a parting thanks to Madelaine as she goes on a new journey. We also take the moment of New Years to comment on the Weir at Ashford which has traveled somewhere down past Mount Usher! It has been completely destroyed by the flooding and a gaping hole left where the concrete once was. This is a problem. Does Wicklow County Council have the resources to fix it? Can we make sure that the Wicklow County Council will fully consult with the Fisheries Board before doing anything? 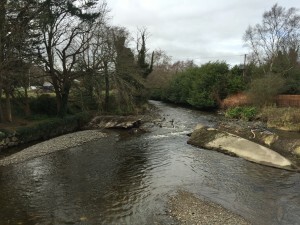 The Weir has a purpose to keep the levels of the river above that minimum height while not presenting an obstacle to the fish traveling above the weir for spawning. The previous weir was poorly constructed from the standpoint of the fish, but no weir will harm them too. It is a double edged sword but the correct people to deal with its new design are the Fisheries as it is difficult to find the correct solution. We have been in contact with the Fisheries and they are monitoring the situation but it is up to the Wicklow County Council to find the money and to consult the Fisheries for their expertise in this matter. Hopefully a solution will be found.